When Zelda opens the Four Sword Sanctuary to check the seal on the monstrous sorceror Vaati, a Shadow Link appears and seals Zelda and the Shrine Maidens in Crystals. Link takes the Four Sword, splitting into four versions of himself, and sets out to rescue the Shrine Maidens and once again seal Vaati away. 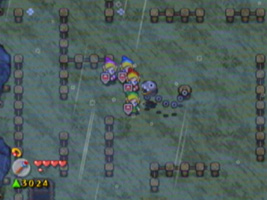 In Hyrule Adventure, up to four players can work together to solve puzzles and defeat enemies. 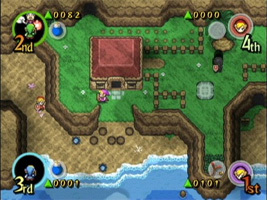 Using the GCN-GBA Link Cable, each player can view their own screen inside of buildings or caves. You can also take part in the multiplayer Shadow Battle, and exclusive to the Japanese version is Navi's Trackers where players must search a town following Navi's instructions. Cheep Cheep, the fish enemy from the Mario series, appears in a number of areas on the Game Boy Advance screen. They seem to be based on the Cheep Cheeps that appeared in The Legend of Zelda: Link's Awakening. On stage 5-2: Kakariko Village, after you've captured all of the bandits head North out of the town to find a maze made of flames. In this maze is a Chain Chomp from the Mario games, hindering your progress by attacking you. On stage 7-3: Tower of the Winds, you can find an enemy based on Thwomp from the Mario series. On stage 4-1: The Field, you can meet a character called Talon. Talon originally appeared in The Legend of Zelda: Ocarina of Time, and his design is based on Mario.